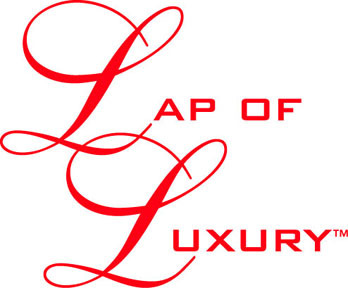 Lap of Luxury makes beautiful, soft lap robes or throws, many lined with the world's highest quality faux furs. These are man-made woven fur imitations. Bask in warmth and beauty. Cover up in comfort. Enjoy the wonderful touch of a fine lap robe from Lap of Luxury. There are more than fifty designs, many using imported, soft cotton velvet prints and solids. Others have elegant brocades or colorful rayon and satin prints. 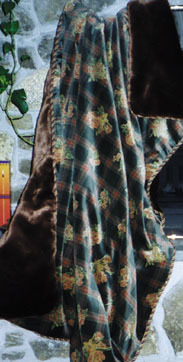 You will see several lap robe styles pictured in these pages. We have been exhibiting our lap robes for several years at high-end craft shows in New York City and Rhinebeck, New York, and in Westfield, Somerset, Edison and Verona, New Jersey. Craft show visitors are amused by our slogan, "Blankies for Adults." Lap of Luxury lap robes and throws have been welcomed in homes all over --- in Connecticut, Massachusetts, New Hampshire, New York, New Jersey, Pennsylvania, Georgia, Texas, Illinois, Indiana, Minnesota, Maryland, the District of Columbia, California, Florida, North Carolina, Nova Scotia, England and Switzerland. These soft, artificial furs, which are imported from France and Japan, are man-made acrylic pile fabrics, beautiful to see and touch. Faux fur of this high quality imitates the luxurious patterns and feel of real fur. By using faux fur fabrics, we never harm any animals. Click on the thumbnail or click a selection at the top to visit another page.